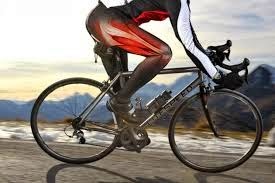 Knee pain isn't uncommon with cycling, even though it's one of the easiest sports there is for knees, and yes, it's most likely just a positioning problem. You'll get a lot of answers thrown out here on this one. The basics of fit for your lower body start with saddle positioning...set it at the proper height and use that one for climbing (if you lower the saddle for downhill or swoopy stuff, be sure you can accurately return it to your proper pedaling height). Sounds as if yours may be too low, but even if it is, your knee pain probably comes from a different aspect of fitting. Next is your foot position on the pedal itself. My first guess is that your pain is coming from here, but it could be a combination of different position issues. Generally you want the ball of your foot to lay across the pedal axle and your foot/heels to go more or less straight backwards in line with the bike. This can vary a little depending on body mechanics and comfort. I'm assuming you're using clipless pedals/cleats...if so, this is a very important aspect of fitting and potential cause of discomfort. It can also be a lifesaver for comfort and knee health, because once you set up the foot position then it can stay there in the best place. If you don't use clipless pedals/cleats, then consider getting some. If you want to use flats and if foot positioning is causing your outer knee pain, then you'll have to be extra mindful to try and get/keep your foot in the right place on the pedal (which can be a hassle on tough trails). Next in line is the fore/aft position of the saddle...this sets up the relationship between your femur length/knee and the pedal axle. This is important, and because of your past injuries this is why I suggest getting a good fitting. The old standard rule may not work for your knees in this case. This position is closely related to the saddle height, and because the seat tube is angled, any adjustment you make to either height or fore/aft will need to be compensated for/readjusted on the other. There's more to it, but for the lower body that's the main stuff to look at. Don't overlook gear selection and cadence, either. If you try to mash up the hills in a taller gear that's putting a lot of stress on both your body and the bike parts, that's just a recipe for future replacements (chains, gears, crankarms, bottom brackets...hopefully not knees. lol). That added stress will magnify any fitting issues you have that may contribute to or cause the knee pain. So consider getting a good fitting for your situation if you can't improve it on your own....it'll be worth the money. If you're chummy with your old PT or the ortho's office, you might give them a call to ask their opinion on your particular injuries...couldn't hurt.